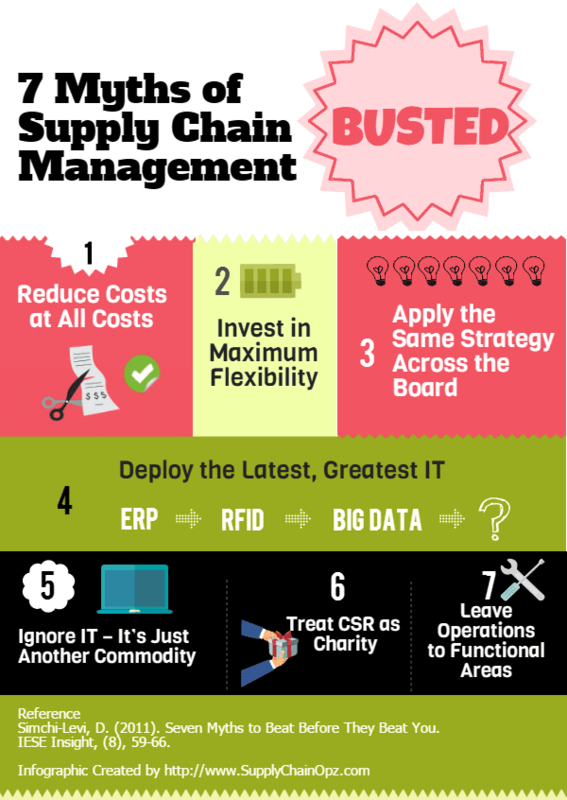 7 Myths of Supply Chain Management Busted! Supply Chain Opz: 7 Myths of Supply Chain Management Busted! 7 Myths of Supply Chain Management Busted! In the fast-paced business environment, people need to make a decision quickly so many of them rely heavily on what they learn from the experiences of others. This shortcut technique can be applied conveniently but the result is often not guaranteed. This article will examine these logics, the 7 myths of supply chain management and explain why you should avoid them. While doing the research for the book "Operations Rules: Delivering Customer Value Through Flexible Operations", Professor David Simchi-Levi of MIT found that there is certain kind of barriers that prevent companies from achieving the better performance. These barriers are the basic principles that make lots of sense but often yield less than desirable results. These "myths" are presented on this infographic and will be explained more in the following section. There are 2 basic ways to increase revenue, increase sales or reduce cost. To increase sales, you need to create the value to products or services but adding the value is hard and require lots of knowledge. That is why cutting cost, which is a very intuitive way of thinking, is a very popular strategy anywhere in the world. However, cutting the cost can hurt both customers and companies. For example, when the company like Toyota chose to cut cost during the product design stage, the result is a faulty car and the legendary JIT manufacturing can't save them for this catastrophe. Many companies create a manufacturing facility that can produce many different product families in the hope that they can increase the product mix and satisfy customer's demand quickly. Is this strategy expensive? To answer real quick, yes, a flexible plant is expensive due to a higher set-up time required and lower machine utilization. Are there any other ways to increase flexibility without investing too much money? Can Dell use "Built-to-Order" strategy to attract customer at retail stores? The answer is no because these customers need something cheaper that they can bring back home on the same day. This customer segment doesn't see "product customization" as the value. That's why now Dell develops the different supply chain strategies for different customer segments. In 2000, Nike invested $400 million in the newest supply chain system. Anyway, there were lots of problems during the implementation stage and the consequence was $100 million in lost sales. Professor Simchi-Levi explained further that, the implementation of mature technology in conjunction with business process improvement always deliver better results. BTW, a bit mature technology is less expensive too! Corporate Social Responsibility is definitely not a charity but a solid strategy. For example, the cosmetics company, The Body Shop, develops the "Against Animal Testing" campaign to attract the new customer and it works! Social and environmental issues are a new way supply chain practitioners can help the company to create the value. Supply Chain Management can definitely create value. Considering how companies like Amazon and Walmart create value through the operation strategies. - Simchi-Levi, D. (2010). Operations rules: delivering customer value through flexible operations. Mit Press. - Simchi-Levi, David. (2011). Seven Myths to Beat Before They Beat You: Flexible Operations. IESE Insight. 59-66. 10.15581/002.ART-1895. - Graves, S. C., & Tomlin, B. T. (2003). Process flexibility in supply chains. Management Science, 49(7), 907-919. - CHAIN, S. (2001). Supply Chain versus Supply Chain: The Hype & The Reality.